Enjoy Cheyenne�s newest and finest lodging accommodations. The Holiday Inn Express Hotel & Suites is located just minutes from the Frontier Rodeo grounds and just 3 miles from the historic downtown district. All guests can enjoy the indoor pool and spa, spacious fitness center, fully stocked business center, meeting rooms and the Express Start Breakfast with no extra charge. Each oversized guest room comes with a microwave, mini-fridge, iron and ironing board, free wireless, high speed internet access, extra large work desk with ergonomic chair, 2, two line phones, ultra comfortable pillow top mattresses, and a spacious bathroom area. The hotel is conveniently located to a wide variety of shops, restaurant and outdoor entertainment opportunities. Come and enjoy Cheyenne�s finest hotel, the Holiday Inn Express. affordable, low cost three star hotels to distinctive, first class upscale full service properties. 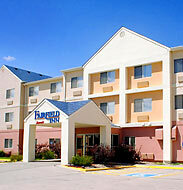 This is a perfect category to find a family friendly hotel for your next family vacation, trip or getaway. They also offer a wide range of amenities and comforts such as room service, restaurants, meeting spaces, and extended services for business travelers.